Our three parishes serve the Essex villages of Layer de la Haye, Birch, Layer Breton, and Layer Marney. We are part of the Church of England and our parishes are situated in attractive rural settings, just south of Colchester. We welcome everyone who would like to join us for our services of worship, or our social events, regardless of the stage he or she has reached on their own spiritual journey. Meeting and worshipping together are essential parts of christian faith and life. Thank you for visiting our website. Here we aim to provide a range of helpful and interesting information about our three parishes and their activities. Lower down this page are links to the main pages on the site, each with a brief explanation of content. If you would like to suggest additions to our pages, please contact the webmaster. 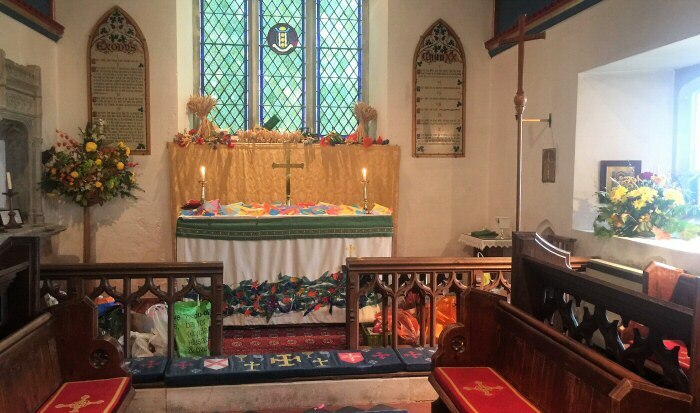 St John the Baptist, Layer de la Haye - Harvest Festival 2018. Photo © Jon Smith. The three 'Layer' parishes are part of the Benefice of Thurstable and Winstree which came into being on 1st October 2013. The other six parishes in the benefice are Tolleshunt Knights with Tiptree, Great Braxted, Messing, Inworth, Copford and Easthorpe. The Revd Anne-Marie Renshaw, based at Tiptree, is Team Rector and has overall responsibility for leading ministry in the benefice. The Revd Lydia Smith, based at Layer de la Haye, is Team Vicar and has day-to-day responsibility for leading ministry in the parishes of Layer de la Haye, Layer Breton with Birch, Layer Marney, Copford and Easthorpe. Details of our usual pattern of Sunday services are to be found on the Services page of this website. This pattern is subject to occasional changes, such as during special seasons in the church's year, so we do recommend that you regularly check for any changes by visiting the Forthcoming Events page of this website and looking in our monthly publications : the Parish Gazette, for services at Layer de la Haye, and Parish News for services at Layer Marney and Layer Breton. For information about future events planned for our Layer churches we recommend that you regularly check the Forthcoming Events page of this site. To discuss a baptism, wedding or funeral in the Layer, Copford and Easthorpe parishes please contact our Team Vicar, The Revd Lydia Smith. The PCCs of the Thurstable and Winstree Team Ministry are committed to the safeguarding and protection of all children, young people and adults and have adopted the suite of Policy and Practice Guidance provided by the National Safeguarding Team for the Church of England. This year our joint Layer Parishes Rogation Walk & Worship will take place on Sunday, 2nd June. It will start at Layer Marney church with breakfast from around 8-30am, followed by worship. Then we walk over the fields to Layer Breton Church where there will be light refreshments. The walk continues across fields to St John the Baptist, Layer de la Haye, where it will conclude with a Service followed by a buffet lunch. Normal times and places of Sunday and weekday services. Locations and brief histories of our three churches. The clergy and key office holders. in our benefice of Thurstable and Winstree, including the 'Layer' churches. An introduction to prayer, with a selection of prayers. The step of Christian commitment. Histories of our churches available here as downloads. The bells at St John the Baptist and the restoration completed in January 2001. A brief descriptive guide for visitors to St John the Baptist. The names, and some biographical details, of those from the parishes of Layer Marney, Birch, Layer Breton and Layer de la Haye who fell in two World Wars. The Data Privacy Notice of the Parochial Church Councils of the nine parishes in the Thurstable and Winstree benefice. The Notice has been prepared and issued in compliance with the requirements of the General Data Protection Regulation. Our parishes are in the Witham Deanery. Witham Deanery is in the Diocese of Chelmsford. To learn more about our large Diocese which stretches from heavily populated East London to quiet rural Essex villages, visit the Chelmsford Diocesan Website.